I can’t believe that I have waited this long to tell you… There is going to be another Color: A Fiber Festival in just a few weeks. It is at the Pacific School of Religion in Berkeley CA on Saturday October 18. If you didn’t make it last time, and you are in SF Bay area and have any interest in yarny or fibery pursuits, you have to stop by. There will be a few local vendors (including me!) so you can pet before you buy… Uh, I mean pet the fiber, not the vendors. There is also quite an assortment of very affordable classes from drop spindling to weaving on hand looms. What’s that you say? Tell you more about weaving on hand looms – sure thing!! I taught a similar class at the last Color, in the spring. 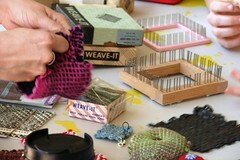 I think everyone had a good time learning how to weave on some of my vintage weave-its. This year it is still just an intro to weaving, and students will get some practice, pointers, and a list of helpful resources. Students are welcome to borrow my looms for the duration of the class. BUT this year I will also have looms available to purchase. I have a few Hazel Rose Multilooms (readily available perfect substitute for weave-its and weavettes) and I will be letting go of a few of my vintage weave-it looms. Sign up for any of the classes through the webpage, or check out the Ravelry Color group for more info (the ravelers are planning a potluck!). Okay.. enough about fiber. Let’s talk about junk. It’s here… My favorite garage sale of the year. The El Cerrito city-wide garage sale. It is THIS Saturday, October 11 from 9 am to 3 p.m. A participant list will be posted on the City of El Cerrito webpage so that you can plan your shopping strategies. Keep in mind that you have to pay a small fee to be published on the map, so those are the serious garage-salers. Many more houses have sales and just don’t bother to pay to get n the map. This year, the neighboring city of Albany is having a sale on the same day, too. That’s a lot of shopping. Here is some of my loot from a few years ago. This year I am hoping to find an ice cream maker and a set of small bowls… And any random pyrex would be an awesome find. What are you gonna look for? 2 Responses to "Upcoming Shopportunities"
Dammit – it seems like just yesterday I was swigging Bloody Marys in the parking lot of El Cerrito Plaza in preparation for the big event. Wish I could come again, but sadly I’ll be stuck here in proposal land…Have fun!